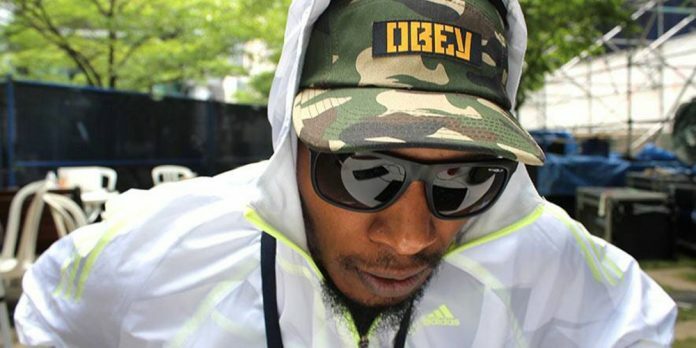 Those who have not heard of Oakland-born rapper Del the Funky Homosapien should know that he is weirder than his name implies. Like an intertemporal rap-chameleon oracle, he prophesies the future, interprets the past and dissects the world around him with constant slick rapid-fire delivery. Evolving from gritty street rapper to psychedelic groover to sci-fi visionary to internet entrepreneur, and inhabiting a few characters in the process, Del has virtually transcended the test of time by staying true to the boom bap fundamentals that first drew fans to him and cousin Ice Cube in the early 1990s. During his performance at Velvet Jones in downtown Santa Barbara on Sunday, Del naturally seemed like more than a homosapien — he became an aggregation of his past rap aliases, jerking around the stage as if possessed by the ghosts of past Del’s, imbuing him with the powers of a rap deity. He told the crowd, “I plan to take you on a journey through my music,” precursing an epic through the funky career of a fundamentally funky man. Underground opener Richie Cunning prepared the mixed-age crowd with a line up of bangers, sounding like Watsky of Pale Kid Raps Fast fame performing over some harder-core J. Cole production. The audience, which had as many kids with fake IDs as belligerently drunk middle-aged adults, gradually filtered from the bar to the dance floor until security moved the wall separating the two shortly before Del came on. With the barrier out of the way the venue felt spacious, with plenty of room to go wild. Extra space to move was a necessity. Del’s performance began with classic, bumping 1990s hip hop before transitioning to more experimental production. When he commanded the audience to “Let the baseline thrash your mind, body, and soul!” nobody could refuse, as Del proceeded to depict the apocalyptic sci-fi world he describes on album Deltron 3030 in the song with the same name. Faces melted when Del performed rock-fusion Hieroglyphics posse cut “At the Helm.” “The Powers that Be” should be made the official anthem of any counterculture movement. Breakout hit “Mistadobalina” re-electrified the crowd during the encore. Although Del always prioritizes rap — going so far as to lead audience members in chanting “this is real hip hop, not a franchise” — he worked the crowd in an effortless way only mastered by veteran performers. Audience members could not help but laugh as Del described a ‘booboohead’ to mean the poop emoji. The subject of his song “Boo Boo Heads” itself resembles the playfully violent and offensive Slim Shady, except that Booboohead was released seven years earlier. Early in the performance Del went beyond comedy to impress fans. He freestyled an entire four minutes without pause, sounding as if he were performing an actual song, before ending to let the audience know what they heard was unrecorded, unperformed material that only they would ever hear. The crowd went wild. The relative intimacy of the venue and Del’s general comfort on stage created an excellent concert atmosphere. He began on time, ended later than advertised and performed enough songs from all eras of his career to satisfy any age group present. Virtually zero choruses interrupted Del’s hypnotizing stream of thought within songs. Del the Funky Homosapien blew the roof off Velvet Jones with phat boom bap, slick rhymes and dazzling presence.